The Senate passed a sweeping budget deal in the early hours of Friday morning – but not before the government technically ran out of money at midnight Thursday, triggering the second shutdown in less than a month. The Senate, which began voting at 1:30 a.m. Friday, approved the deal 71 to 28. This shutdown could be just hours long and cause minimal disruption if the House follows suit and later Friday morning also passes the two-year budget package, which includes funding to keep the government running through March 23. Members of the House were warned they might need to vote on the measure the Senate passed between 4 a.m. and 6 a.m Friday, and, as the hours dragged on, procedural concerns meant a House vote mid-morning Friday appeared possible. 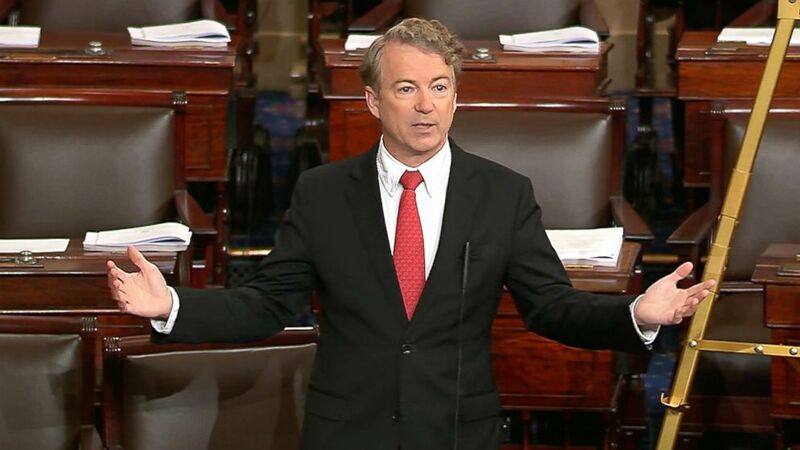 The Senate vote was delayed until past midnight by Kentucky Republican Rand Paul – who spoke passionately for hours on the Senate floor Thursday evening as he tried to force a vote on an amendment that would effectively undermine the budget deal. Paul claimed the price tag is too big, and that instead of spending more on defense, the U.S. should withdraw from Afghanistan. “I know he wants to make a point. He has that right. I agree with many of his concerns about deficits and debt. But we are in an emergency situation,” Cornyn said. Throughout the day Thursday, Republicans and Democrats in Congress remained at odds over the sweeping bipartisan budget deal that would boost spending on military and domestic priorities and increase the nation’s debt limit but leave unaddressed the controversial status of young immigrants known as Dreamers. The Senate delay meant more time for liberal Democrats and Republican fiscal hawks in the House to whip up votes against the bill in their chamber. They oppose it on concerns over immigration and deficits, respectively. The two-year budget deal would lift caps on defense and non-defense spending by $300 billion over two years. It also includes: $6 billion to fight the opioid crisis; $5.8 billion for child care development block grants;$4 billion for veterans medical facilities; $2 billion for medical research; $20 billion to augment existing infrastructure programs; and $4 billion for college affordability. The measure would extend government funding at current levels until March 23 to allow lawmakers to finalize details on the spending in a separate measure. As part of the deal, lawmakers would also raise the nation’s debt limit into 2019 avoiding the risk of a potential default. “I think we will get this done. I feel good about it,” House Speaker Paul Ryan, R-Wisc., told radio host Hugh Hewitt in an interview Thursday morning. “Part of it depends on the Democrats. This is a bipartisan bill it’s going to need bipartisan support. We are going to deliver our share of support. I feel very good about Republicans,” he said. Democrats, disappointed that the measure does not address the status of Dreamers, have protested the spending package and their potential loss of leverage in future immigration negotiations if it goes through. House Minority Leader Nancy Pelosi says she will vote against it. “I’m just telling people why I’m voting the way I’m voting,” she said Thursday. “Many of our priorities are in the bill. But I have an unease with it and hope that the Speaker will man up and decide that we in the House can also have what Mitch McConnell guaranteed in the Senate: a vote on the floor [on immigration],” Pelosi said. Many lawmakers of both parties privately signaled the expectation that the bill will pass but by a razor-thin margin. The uncertainty was keeping the capital on edge. White House principal deputy press secretary Raj Shah said the president is also concerned about spending in Washington, but that the White House supports the bipartisan budget agreement. “It lifts caps on defense spending, which is something the Secretary of Defense, the President’s Generals, told they would need to ensure that we rebuild our military and protect our national security,” said Shah. Shah said the White House will be releasing a budget on Monday. “The budget does move us towards a path of restoring fiscal responsibility. It reduces our deficit by trillions of dollars,” said Shah. Included in the White House’s budget will be the new tax reform bill and “other priorities” from the administration. ABC News’ Meridith McGraw contributed to this report.